Orlando appears to be suffering from a string of bad luck, the latest being that of the death of a two-year- old boy who was snatched up by an alligator from the water at Walt Disney World June 15 th . The body was later found in roughly the same spot where the attack occurred after a frantic 17-hour search. 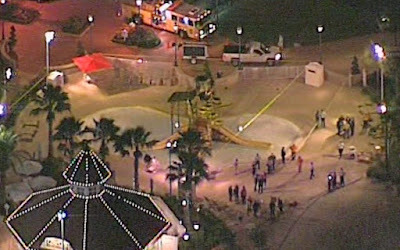 CNN’s update on the event reports that divers from the Orange County Sherriff’s Office were able to recover the body of Lane Graves from the waters of Disney World’s Seven Seas Lagoon around 1:45 PM of Wednesday June 15 th , in the general area where an alligator appeared and dragged Lane into the depths upon happening on the boy wading at the shallows of the water between 8 to 9 PM the evening before. Lane’s body had been found whole, with only puncture wounds from the gator’s teeth, in 6 feet deep water about 10 to 15 yards away from the location where he had been grabbed. Later that Wednesday, Orange County Sherriff Jerry Demings said in a police conference covered by USA Today that Lane’s parents, Matt and Melissa Graves from Elkhorn, Nebraska, had been vacationing in Walt Disney World with their son and were staying at the Grand Floridian Resort right next to the Seven Seas Lagoon. It was on these shores that Lane was playing on the shallows at around 1-feet depth, and where the alligator found him. A “No Swimming” sign was posted nearby but went unnoticed. Upon seeing Lane being dragged off by the fierce gator, Melissa Graves called for a lifeguard while Matt waded into the water to pry the reptile’s jaws open, only for the animal to escape, dragging their son along. An autopsy report gotten by Reuters from the Orange County Medical Examiner’s Office ruled Lane’s death as being caused by drowning. As for why his body was found intact, host Jeff Corwin of ABC’s “Ocean Mysteries” explained that the interference of the boy’s father caused the gator to lose interest in Lane as a meal and let him go after escaping, leaving the boy to drown in the water instead. Seven Seas Lagoon separates the Grand Floridian and Polynesian Village Resorts from the Magic Kingdom area of Disney World, and is connected to several canals leading to large bodies of water, enabling alligators from these places to reach Disney World property. The resort has long posted “No Swimming” signs in areas around the lagoon but has not specified danger from attacking stray gators. Bob Iger, chairman and CEO of the Walt Disney Company, has expressed his condolences to the Graveses, who were distraught for their loss but relieved their son’s body was quickly found. Disney World has closed its resort beaches for safety concerns while authorities comb the lagoon to drive off or kill any alligators found, hoping to identify the one that attacked Lane. A senior Disney source also revealed that explicit alligator warning signs will also be installed in all Disney World resort waterways in the future.